In the first episode of the series, Ray Mears explores the Forest of Dean in Gloucestershire, using his tracking skills and expert wildlife and plant knowledge to reveal its secrets to viewers; from the rare sight of wild boars and their piglets foraging, to finding the wild-growing edible ingredients for a uniquely British salad. Situated between the Severn estuary and the gorges of the river Wye, it’s one of Britain’s few remaining ancient forests and covers 27,000 acres. The diversity of trees and plants in an ancient forest is not only beautiful but also provides food for a variety of animals. Ray visits in the spring when the forest is bursting with life and carpeted with radiant bluebells. He is hoping to see creatures that, until recently, were extinct in this area – the elusive goshawk, the magnificent wild boar and the hazel dormouse. He reveals that deer are actually the reason why the forest exists today; in the 11th century, the area was protected as a royal hunting reserve where kings could hunt wild boar, red deer, roe deer and fallow deer. Recently, the loss of habitat caused by the construction of new roads and poor woodland management means that the common dormouse is not so common anymore. Ray meets female wildlife ranger Elizabeth ‘Sid’ Davis, who shows him the nest boxes which have been set up to help the mice hibernate. He is delighted to discover that the boxes are working well and that the dormice are now thriving in the area. The rich habitat of the forest is home to a variety of birds, mammals, insects and plants. But recently, one important forest inhabitant has been missing; the wild boar was a favourite quarry for the Royal hunt and 300 years ago, the last boar was hunted out. They have recently been reintroduced to the forest and Ray is delighted to see some boar and their piglets feeding in the forest. On his journey through the forest, Ray also sees adders, wild goshawks and fallow deer, and takes advantage of the abundance of available plants to make a delicious wild salad of saxifrage, wood bittercress, wild garlic, small leaved lime and cherry blossom. This entry was posted in Ray Mears on October 5, 2010 by Woodlore Team. So what if the forestry commission cull boar? deer are culled, squirrels are culled and if not managed appropriately all wildlife will suffer. hey guys. im having d same problem, i live in ireland nd cant access that link 😦 any1 know a way around it? Trevor, if you’ve got Sky you might be able to access ITV on Services and then Other Channels from your menu page. I live in Co. Offaly and am able to watch ITV although I’m not able to record it. Hope this helps. what on earth is wrong with the people posting on here, criticizing Ray for doing survival shows elsewhere, as an Agoraphobic I love these shows because they take me to places I could never go whether it’s Mongolia or the forests of the UK. so stop complaining and enjoy the places Ray takes us to and the things he informs us of. Lee Davies is exactly right in what he said. Can’t wait to see this but I’ll have to wait until it comes out on dvd as I don’t have ITV. Ray has a huge following here in Ireland. Really respect his attitude towards native peoples. Looking forward to seeing his talk in Belfast in November. Well i watched it, and i must say, it was excellent, so much so, i’ll be watching it again. I had to do a sickie from band practise for this because I can’t record ITV on Sky(I live in Rep of Ireland.) An utterly brilliant programme again. I love how Ray presents his shows without all the histrionics that other presenters seem to favour. It seems to make the natural world inviting rather than a challenge for the brave. What am I going to do next Monday though? Can’t really be sick again…can I? I am glad Ray was brave enough to promote his personal like of wild boar in the forest whilst in the company of the Forestry Commission who cull them. Boar add another dimension of wild to the Dean. 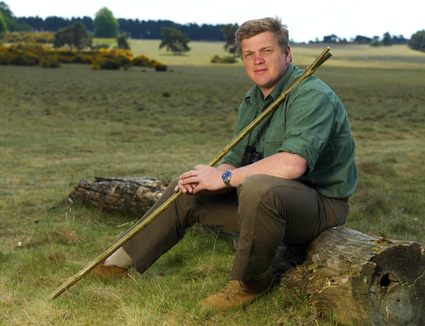 I am so happy that Ray Mears is coming to the Forest of Dean, I live in the Forest, literally IN THE FOREST most of the time. I hope he goes to some of my favorite places to forage. The Forest is full of secret places, ancient sprigs, unpublicized cave systems, secret forest dwellings, [like mine]. It is a land of character, renowned for its rebellious and independent people [you wait, NWO], the “foresteres”, with their own dialect which verges on its own language which, to the “outsiders”, and townsfolk, seems incomprehensible. Ray is one of the few people that locals would happily share the secrets of the forest with. We love him here, I wish he lived here, and ran courses. I have been watching Ray since I was a child and I love his shows. Im looking forward to Wild Britain. looking forward to this. Im a bit tired of wildlife/survival shows in remote parts of the world i can’t afford to go to, so when its in a temperate forest in the uk, its amazing. keep it up. hopefully i’ll bump into ray in some forest some day. that would be trippy. Damn, its on a Monday, i was hoping for an interlude between Strictly Come Dancing and X Factor. Monday it is, and i can’t wait. Cor come on guys, don’t you have anything positive to say??!! Ray is fantastic! He’s brought knowledge and entertainment to our living rooms. Of course he’s an expert – he’s devoted his life to the outdoors and survival, which couldn’t be done without the broad set of skills and expertise he has. Ray, you’re an inspiration and I thank you for increasing my knowledge and fuelling interest in the outdoors to 100’s of others around the world. Sir Ray Mears please Queenie!! When will it be shown on ITV1 Wales? I didn’t realise Ray was an expert in wildlife. A wildlife expert is someone who has worked with and studied wildlife over a number of years, like the late Steve Irwin or Bill Oddie. I suppose Ray has the name now so can draw an audience.